– Evidence and witness statements from previous cases can be used to solve new cases. 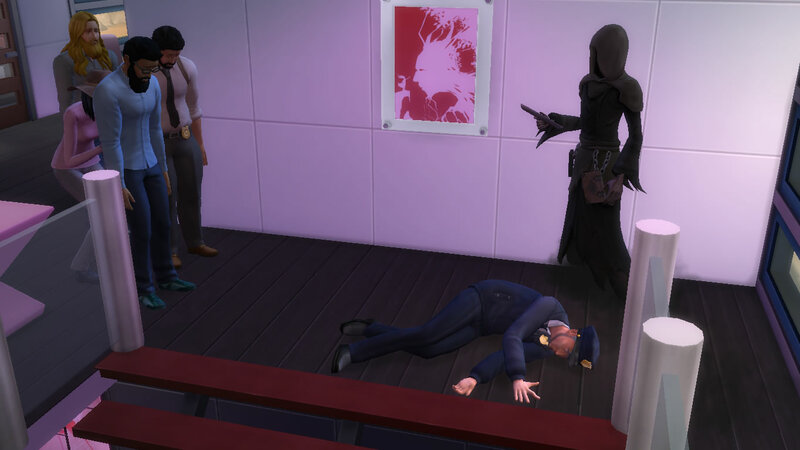 In reality, that doesn’t make any sense, but it does seem to work in my game — as in, this has never created an inaccurate description of the suspect, or caused me to arrest the wrong sim (though other simmers have reported their clues were inaccurate, so their arrests became false). As a result, my detective sometimes does not need to go to the new crime scene for the new case, to get new evidence or interview new witnesses. 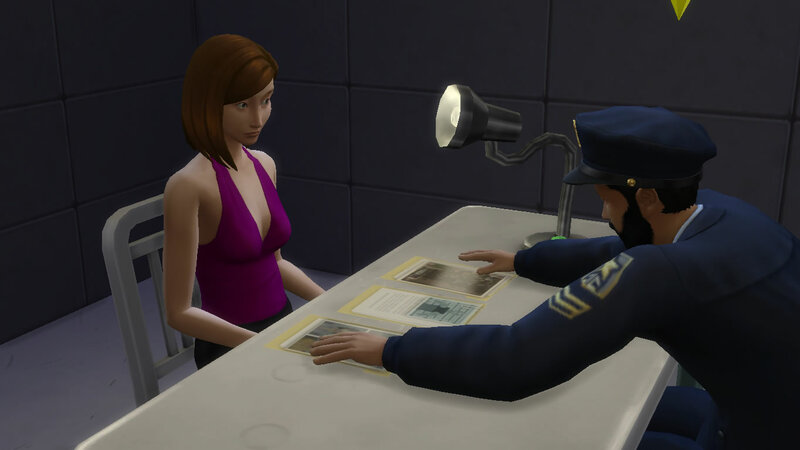 – Buying the “Observant” reward trait helps my detective to instantly know all traits of any sim he introduces himself to, so he can arrest the correct sim shortly after issuing the APB. 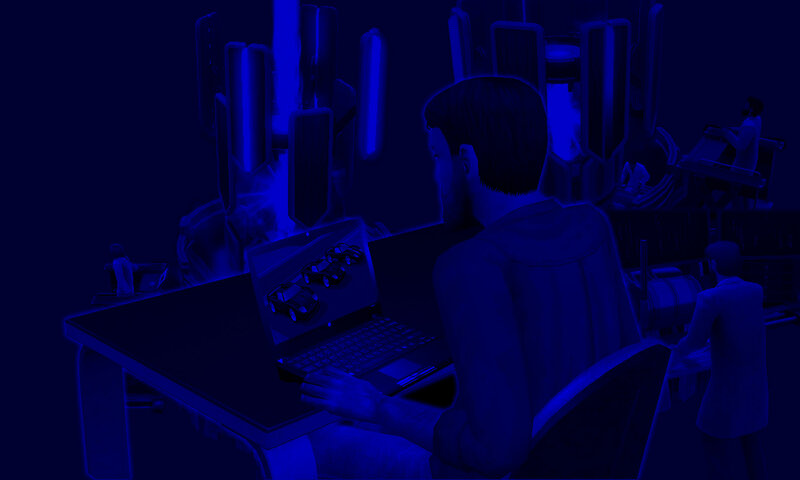 – So far, all the suspects have been randomly-generated townies, which makes sense in terms of gameplay, because the player is less likely to be familiar with their traits in advance. – The other detectives at the police station seem to do nothing. My detective has to solve all cases by himself, for all stages from the investigation to the interrogation. – At least in my gameplay, (some of) the imprisoned criminals seem to be different every day, or every two days. Taking mugshots, searching or fingerprinting these criminals are low-level tasks that my detective only bothered with when he was new to the job. As he progressed, working hours are better spent working directly on the case itself. – The most efficient interrogation technique for my detective tends to be: Show evidence, witness statements, fingerprints or crime photos, then “bad cop” techniques of “Play Crazy Cop” and “Describe Prison Horrors”, or if he is Focused, “Ask Trick Question”. This approximate sequence often causes the suspect to confess before the work day is over, even if my detective has to “stay late” for it. It’s worth staying late, as the case is only closed after the suspect is locked up (immediately after the confession). 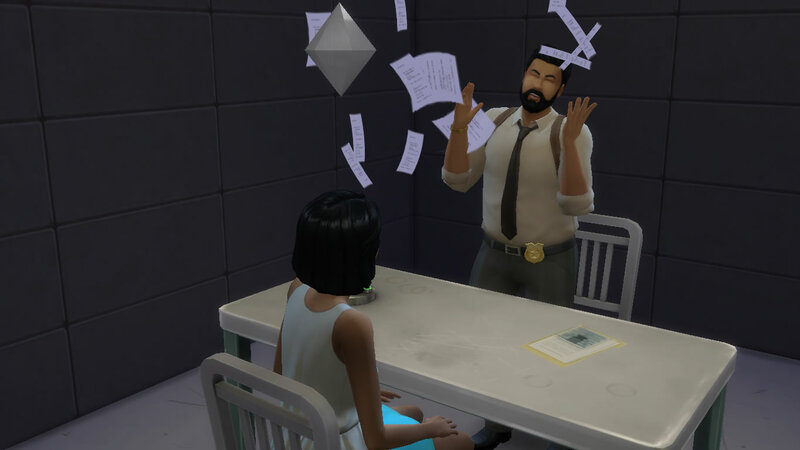 Good thing the prison cell is next to the interrogation room, to prevent losing precious sim minutes by walking. – Building relationships with colleagues also does nothing for my detective. As a result of my rotational gameplay, I didn’t play as him for a sim week. When I next followed him to work, all his colleagues have changed. This could be a result of my Aging Setting (Played Sims: Aging Off. Unplayed Sims: Aging On), or the Sims 4 game randomly deleting “townies” (unplayed sims who are “not currently in world”). – As this is the “Solar Flare” Lounge community lot, I didn’t want this colleague / townie’s urn permanently blocking the stairway, so I took it back to my home lot via the inventory. – The next time I tried following my detective to work, my game crashed. – So I tried moving this colleague’s urn to another residential lot, by moving in a random unplayed sim (an elder female) into my detective’s home lot, taking away the urn in her inventory, and moving this random grandma to a different residential lot. – Then I went back to my detective’s home lot, and tried to follow him to work. Game crashed again. – So I went back to the random grandma’s home lot, put the urn into her inventory, evicted her, and deleted her. – Those of you who watch my STM series may recognize the blond dude and the guy in the light blue shirt as two of the Racing Men or Specter Yard investigators. They don’t seem to know the deceased officer as well as the female townie in pink. All three of them happen to be the “Witnesses” in this case. At the start of the crime scene scenario, Witnesses seem to have at least one Sad emotion buff, which appears to be removed once the detective has taken a Witness statement from them, which could possibly be how the game limits each Witness from giving more than one Witness statement. – Before the colleague officer’s death, my detective had already taken Witness statements from all three Witnesses. – After everyone “witnessed the death”, all three Witnesses ended up with Sad emotion again. My detective was able to obtain a SECOND Witness statement from ALL three of them.